The Rewari District Consumer Disputes Redressal Forum has directed the respondents - KLP College, Rewari, and Maharshi Dayanand University (MDU), Rohtak, to pay damages to the tune of Rs 10,000 to the complainant, Rinku Yadav, a student of BSc-I of the college, holding the respondents accountable for deficiency in service which resulted in a loss of one precious year of the complainant. Haryana Chief Minister Bhupinder Singh Hooda laid the foundation stone of an integrated campus to be constructed at a cost of Rs 121 crore here today. The 23rd annual Surajkund Crafts Mela will be inaugurated tomorrow by President Pratibha Devisingh Patil. Minister for Tourism, Haryana, Kiran Choudhry said today that all preparations, including elaborate security arrangements, for the 15 day-cultural extravaganza, were in place. A local court today sentenced four persons, including two cops, to 10 years of rigorous imprisonment each in a case of smuggling of heroin. The district police has registered a case against unidentified persons for making a threat call to PP Kapur, who had filed a petition in the Punjab and Haryana High Court that had brought to light irregularities in allotment of plots that were meant for industrial workers in Panipat. In their latest offensive against the sale of narcotic drugs, the drug-control authorities from the state headquarters today raided two medical shops in Sirsa town and sealed another at Ratia in Fatehabad. A five-year-old girl was allegedly raped by a person in Gagsina village, 17 km from here, on January 29. General-secretary of the School Teachers Federation of India (STFI) K Rajendran today demanded that the right to education should be extended to children below the age of six years. The Haryana government today signed an agreement with Reliance Infrastructure to improve and upgrade Gurgaon-Faridabad and Ballabhgarh-Sohna roads on build, operate and transfer basis at an estimated cost of about Rs 180 crore. Leaders of the INLD and the state unit of the BJP today called upon the activists of both the parties to work unitedly for the success of the alliance candidates in the forthcoming Lok Sabha elections. The absence of several complainants at meetings of the District Grievances Committee left Mange Ram Gupta, Haryana Education and Transport Minister, who presides over the meetings in the district, fuming today and he asked the officers concerned to act against such persons in future. Ramdiya of Sahibabad village was killed in an incident of firing at a marriage party in Sisana village, the native village of the bride, late last evening. The victim was a relative of the bridegroom, Amarjit, of Mundaka village in Delhi. The Gohana police raided three machinery stores in the market and seized a large quantity of fake diesel and oil filters from the stores. The Haryana government has formulated a comprehensive programme to develop and reinforce its transmission and distribution infrastructure for providing quality and reliable power supply to consumers under which Rs 4,623.93 crore will be spent during the next three years on the construction of new substations, the augmentation of the existing ones and on connecting lines. Various competitions were organised among students to mark the 128th jayanti of Deenbandhu Chhotu Ram here today. The police yesterday nabbed three fake journalists, who were allegedly trying to fleece local doctors by blackmailing them. Irked over no headway in a dacoity of over Rs 20 lakh from a house of a plywood industrialist residing in Sarojni Colony, representatives of the plywood industry along with the victim family yesterday met the SP demanding the arrest of the accused. Giving yet another twist to the high-voltage drama of changing religion and marrying Anuradha Bali (now Fiza) after deserting his first wife Seema Bishnoi, former Haryana Deputy Chief Minister Chander Mohan (now Chand Mohammad) said here today that he still loved Seema and there was no question of leaving her. “I still love Seema immensely and will not leave her at any cost,” he said on being confronted by mediapersons in Sector 14 here. Making an appearance in Gurgaon days after his second wife alleging that he had been kidnapped, Chand hinted that he was under pressure to leave Seema, but did not clarify who was pressurising him to do so. 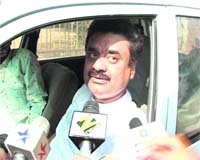 Denying the allegations of his kidnap levelled by Fiza at a recent news conference, Chand maintained that he respected Fiza and both of them knew about the whereabouts of each other. “There is no tension or misunderstanding between us,” he asserted. On being probed further, he snubbed the mediapersons by stating that this was a matter of love, about which they knew little. The former deputy CM, who seemed to be in a disturbed state of mind, kept on mumbling that there was no pressure on him. He even hurled abuses at mediapersons. Seated in a Maruti Zen, Chand talked to journalists in bits and pieces, making the driver move the car intermittently. After having deposited all necessary documents, including the migration certificate, Rinku Yadav, a resident of Pali village, near here, got admission to BSc-I in the college here in July 2006. She appeared in BSc-I examination of the MDU under roll number 427376 in April 2007. She was placed under compartment in chemistry. However, she failed to get her detailed marks card of BSc-I from the university. Still she attempted to appear in the supplementary examination of BSc-I, which was to be held on October 3, 2007. However, she could no take the examination as the university did not send her the roll number slip on the plea that she had not submitted her migration certificate as yet. Contrary to this, the KLP College authorities maintained that they had already sent her entire documents, including the migration certificate, to the university. Thus owing to “misplacement” of her migration certificate apparently by the university authorities, she lost a chance to appear in the supplementary examination. Subsequently she was allowed to appear in the supplementary examination held in April 2008, which she passed. Rinku Yadav, who lost one precious year of studies for no fault of hers, filed a petition in the consumer court, which pronounced the order. The campus will comprise four institutes, including the State Institute of Design and Fashion Technology, State Institute of Film and TV, State Institute of Fine Arts and State Institute of Professional Studies for Women. Hooda said all these institutes would be constructed on the pattern of national-level institutes. He said the youth would get training on the pattern of National Institute of Fashion Technology, National Film and TV Institution, Pune, and Delhi College of Arts. He said these institutions were being developed as autonomous institutions with full autonomy from the very first day. He said the admission for the first batch would start from July next. Hooda said 85 per cent seats in these institutions would be reserved for students of the state. He said 18 acres costing Rs 3.84 crore had been given by the panchayat of Makroli village for the construction of residential premises. He said a seven-storey building would be constructed near these training institutes having all required facilities, including library, computer centre and an auditorium. As many as 90 seats would be made available in the TV and Film Institute while a total of 180 seats would be made available in the Fashion and Technology Institute. Similarly, the Institute of Fine Arts would have 180 seats (30 each in BFA applied arts, BFA painting, BFA graphics and print making, BFA sculpture, BFA applied arts, BFA painting). The Chief Minister said a special thrust was being given to promote technical education in the state so that ample opportunities of employment could be generated. For this, the budget of the Technical Education Department had been increased five times. Similarly, the number of seats in technical institutes of the state had been increased to 87,000 from 23,000. 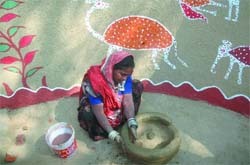 The 23rd annual Surajkund Crafts Mela will be inaugurated tomorrow by President Pratibha Devisingh Patil. Minister for Tourism, Haryana, Kiran Choudhry said today that all preparations, including elaborate security arrangements, for the 15 day-cultural extravaganza, were in place. She said 78 CCTV cameras had been installed at various places of the mela site. 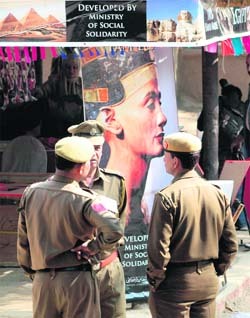 She said 400 craftsmen from Egypt, Thailand and SAARC countries, including India, would take part in the event. She said Pakistan had also been invited, but it had not sent its craftsmen to take part in the cultural event. She was speaking after the launch of a website of Haryana Tourism at a local hotel. Madhya Pradesh had been chosen the theme state for the mela and Egypt would be the first country to participate as a “partner country” in it. She said for the first time women from self-help groups would take part in the event. The ticket price has been raised from Rs 40 to Rs 50. Additional District and Sessions Judge JS Dahiya sentenced Surender, a resident of Tharwa of Fatehabad district, Raj Kumar, a constable with the Rajasthan police, and Pardeep, a resident of Bhuna here, to 10 years of rigorous imprisonment each and imposed a fine of Rs 1 lakh each, while Karan Singh, Assistant Sub-inspector in the Haryana police, who was also involved in the crime as well as harbouring the criminal, was sentenced to 10 years’ rigorous imprisonment and imposed a fine of Rs 2 lakh on him. The police had received a tip off regarding the smuggling of contraband on November 14, 2006. The police raided the local Hans Market area and arrested Pardeep with 770 gm of heroin. Surender and Raj Kumar, who were also present at the time of raid, managed to escape. The police, however, arrested the two later. The accused later revealed that Karan Singh was also involved in the crime and the mobile call records of the four confirmed his involvement. The accused were booked under Sections 21, 27-A, 29 and 85 of the Narcotic Drugs and Psychotropic Substances Act. The case was registered at the Samalkha police station late last evening. Kapur had told the police that though he could not identify the person who had made the call, he was sure that industrialists, whose allotments had been ordered to be cancelled by the high court on January 20, were behind the call. Kapur had received the call on January 28. The caller had threatened him to withdraw the PIL filed by him in the high court within three days or else he and his family would be eliminated. Kapur had also approached the Punjab and Haryana High Court with regard to the call. Besides, the media had also highlighted the matter following, which a case was registered. The raids were conducted after the authorities got a tip-off regarding large quantities of cough syrup containing codeine and used for a high by students and drug addicts having been supplied in the area. The authorities have collected the sale and purchase record of two local chemists and have also frozen the stock of some incriminating drugs in one store. A team raided a chemist shop at Ratia town in Fatehabad in the morning today and sealed the shop after huge quantities of a cough syrup containing codeine, a narcotic drug, were seized from there. After getting the lead from Ratia, the team came to Sirsa and raided a wholesale chemist in the local Janata Bhawan road and another at Subhash Chowk. The mother of the victim, in her complaint lodged at the Gharaunda police station, alleged that her daughter had gone out to play near a well. When she did not return till the evening, she went searching for her and heard the cries of the girl near the well. To her shock she found that the girl had been raped by Narinder, who ran away from the spot on seeing her. A case has been registered. In another incident, the police has registered a case of kidnapping against Puneet, a resident of Subash Gate, and Varinder Bhatti under Sections 365 and 120-B of the IPC in the Civil Lines police station on a complaint lodged by Hari Krishan whose son Atul went missing on the night of January 29. In his complaint, Hari Krishan said that his son, who owns a shop at Namaste Chowk, did not return home from after closing the shop and his car was found abandoned near Green Gate in Sector 7 yesterday. Hari Krishan claimed that Atul was in love with Puneet’s sister and wanted to marry her and he suspected that Puneet and his sister’s fiancée Varinder were involved in kidnapping. Addressing the fourth national conference of the STFI here, he said the current law ensured the right to education to children between the age group of six and 14 years. The rule had neglected children below six years of age even though education was necessary at this age also. Expressing concern over commercialisation and falling standards of education, he said currently there were more than 6 lakh guest teachers in the country. If the state governments wanted them to raise the standard of education in government schools, their services should be regularised. Criticising self-financed schools, he said such schools exploit teachers despite charging exorbitant fees. Jai Ram of Puducherry suggested that the governments allocate more funds for primary education, as that was the most crucial phase of schooling. Secretary of the STFI M Sanyukta said state governments should not abdicate their responsibility of providing adequate schooling facilities to children. She said commercialisation of education was the direct outcome of the government’s failure to provide good educational facilities. Balbir Singh of Haryana said the state government must immediately recruit 50,000 teachers to ensure that its schools were adequately staffed. He also expressed concern over rising instances of sexual exploitation of girl students in government schools. A spokesman for the Public Works Department said under the project, the road from Gurgaon to Faridabad would be four-laned and that from Ballabhgarh to Sohna would be widened to 10 meters. Besides, some links of roads like the MCF road, crusher zone road and Pali Bakhri road would also be improved as part of scope of work. With the completion of this project, travel time would be reduced considerably and would afford comfortable and safe driving to the commuters. In addition there would be huge savings by way of vehicle operating and maintenance cost. He said engineer-in-chief, PWD (B&R), Mahesh Kumar and CEO, (Roads/Business), Sudhir Hoshing signed the agreement on behalf of the Haryana government and Reliance Infrastructure, respectively. He said Reliance Infrastructure would deposit an amount of Rs 150.30 crore to the state government. Addressing a joint rally organised by the two parties on the occasion of the birth anniversary of farmers’ leader Chaudhary Chhotu Ram here, former Union Minister and senior BJP leader Sushma Swaraj said it was like a do-or-die situation for BJP and INLD workers. She said the past experience showed that only unity and hard work at ground level could do the job and members of both the parties should fan out in rural and urban parts of the state so that the alliance could come out victorious in all 10 seats in the state. She, however, cautioned that the future of the alliance would get weak and bleak in case the workers of the two parties were not united and suffered any miscommunication and doubt regarding any issue. Describing the United Progressive Alliance (UPA) government at the Centre as anti-people, she claimed that the forthcoming general election would provide good opportunity to the people of the country to teach a lesson to the UPA. The minister, who had come to the town to preside over a meeting of the District Public Relations and Grievances Committee, was particularly irked when several complainants, whose complaints were taken up for hearing at the meeting, were found absent. At some meetings persons who had lodged complaints backtracked without informing the authorities. This resulted in unnecessary waste of time and energy of the members of the committee. In all, 10 complaints were settled at the meeting. The baratis were reportedly under the influence of liquor and started quarrelling with each other. Someone among them allegedly resorted to firing and Ramdiya was hit by a bullet. He was taken to a private hospital at Kharkhoda by some baratis, but since he had already died by that time, they left the body on the doorstep of the hospital and allegedly escaped. A case has been registered. Members of both families were shocked over the incident. However, the marriage was solemnised. The store owners - Naveen of Bharat Machinery Store, Rajinder of New Bansal Machinery Store and Rajesh of Ritik Dahiya Spare Parts - have been arrested and cases have registered against them in the Gohana City police station. According to SSP Navdeep Singh Virk, the raids were conducted after receiving a complaint from Gaurav Kumar Bedi of MICO Motor Industries, Bangalore, in which it was alleged that the machinery store owners had allegedly been using the stamp of the company on fake filters. The police seized 104 fake filters from Bharat Store, 97 from New Bansal Store and 55 from Ritik Dahiya Spare Parts. This was stated by Member of Parliament Deepender Singh Hooda after inaugurating a 33 kV substation constructed by the Uttar Haryana Bijli Vitran Nigam here today. It will benefit 1,642 electricity consumers of Jindran, Ghuskani, Khidwali and Katwar villages. He said seven substations of 400 kV capacity, 26 of 220 kV, 49 of 132 kV, 26 of 66 kV and 92 of 33 kV would be set up in the state during the next three years. Simultaneously, the existing capacity of 15 substations of 220 kV capacity, 40 of 132 kV, 32 of 66 kV and 28 of 33 kV would be augmented. The Chaudhary Chhotu Ram Memorial Society, Sonepat, organised the competitions to highlight the philosophy of Deenbandhu Chhotu Ram and his contributions in ameliorating the sufferings of farmers and labourers during the pre-independence era. Awards were given by the president of the society and eminent educationist Hoshiyar Singh Malik. Paying tributes to Chhotu Ram, Malik recalled him as the “Kisanon Ka Messiah”, who enacted nine laws in united Punjab before 1947 to save farmers from exploitation of moneylenders. Chaudhary Chhotu Ram was the brainchild of the Bhakhra Canal project, which was prepared to meet irrigation drinking water requirements of Haryana region of Punjab, he added. Renowned scholar Dr Sant Ram Deswal and Prof Raj Kala said Chhotu Ram was the champion of the communal harmony and registered his protest against the two-nation theory by writing a letter to Mahatma Gandhi in 1944. The police has booked them on the complaint of Dr Vikram Kamboj, secretary of the local chapter of the Indian Medical Association. The accused - Ashok Sethi, Anil Kumar and Rajender Sachdeva - had gone to collect money from a local doctor, Vinod Batra, when they were overpowered by his staff and handed over to the police. Later, some other doctors also reached there and made a collective complaint to the police through the IMA. They maintained that industrialists should be issued the licences of weapons on a priority basis for their safety. Eight masked men had decamped with cash and jewellery worth Rs 20 lakh from a house of a plywood industrialist, Vishwanath, on January 21. The miscreants had looted the industrialist at gunpoint. SP Vikas Arora said a team headed by DSP Ashok Kumar, which had been entrusted the task to probe the matter, got vital clues in the case and would soon be able to arrest the accused. He assured the plywood industrialists that the culprits would soon be put behind bars.